Abram’s chemotherapy graduation shirt couldn’t be more appropriate today. He endured a lengthy, ROUGH and painful port access. Accessing the port in his chest is always tricky. During the port placement surgery, the line kinked, and the doctor was forced to set it in a little deeper and at a slightly different angle. Sometimes, that makes for a troublesome access with repeated pokes to find the “sweet spot.” Today was one of those sometimes. With all of the surgeries and treatments and tests the little guy has been through, the port continues to be one of his hardest hurdles. On a brighter side, we love Lurie Children’s Hospital; they have taken care of Abraham since our terrifying emergency room run in May 2014. The staff is talented, tireless and kind. Today was no different. The skilled nurses dealt with the stubborn port, child life kept the music and jokes coming while I held his little hand. 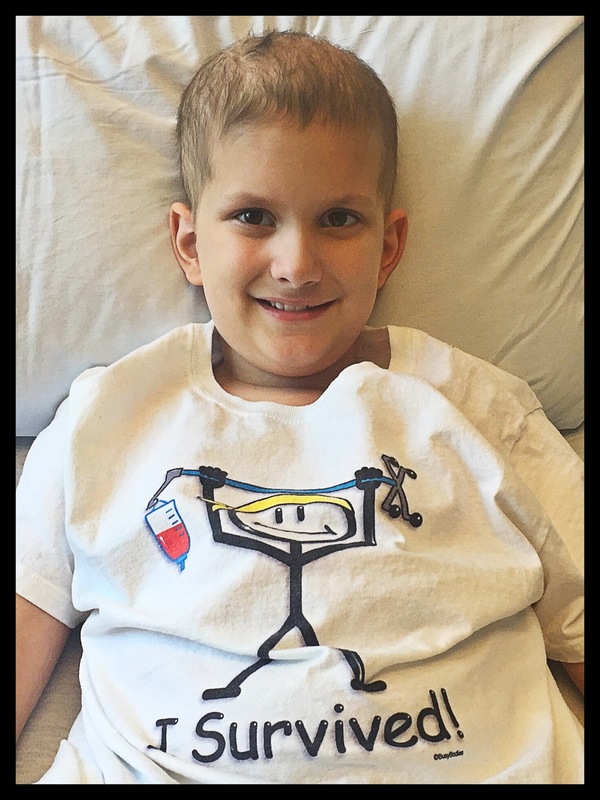 Currently, Abraham requires extensive monthly labs and a two-hour antibiotic infusion. The infusion causes stomach upset and nausea. He is currently fighting that back, but I can see he’s struggling. My sister is with us, and the little champ is bravely taking care of his business here in the infusion clinic. Today, I should have been in my 8th grade classroom, sweating in the heat with my fellow staff and 100+ new students beginning the 2016-17 school year. Instead, I am in Chicago while Abraham gets the care he needs. Even as I type these words, I am certain this is where I should be-helping my son get better. Please keep the positive thoughts headed our way as the day unfolds. Blessings on all of you Jac. You are right where the good lord had so graciously placed you. Loving your boy. Showing your two boys what Servant leadership looks like. Standing w Chris to provide a united family structure. I’m very proud of you and I know your mom would be also. As my late hubby used to remind me in the midst of a storm, “Yvonne these are good days.” And they were. Happy tears, Yvonne, thank you. Bless you for sharing your husband’s wisdom and for lighting a path for our family.